While I am knitting the leaf socks, I might as well be planning my next project. I am thinking of knitting Nancy Bush’s “Meida’s Socks” with the self striping pink, blue, and yellow on-line yarn. 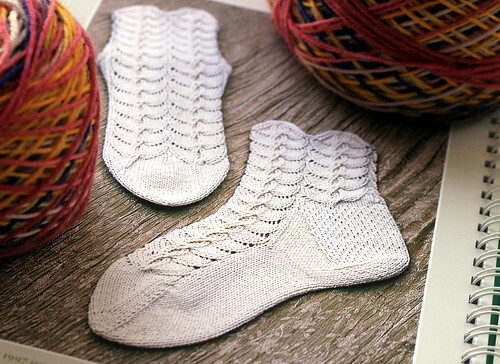 The pattern is in “Favorite Socks, 25 Timeless Designs from Interweave”. This entry was posted on Wednesday, June 24th, 2009 at 3:00 am and is filed under Knitting. Tagged: Knitting. You can feed this entry. You can leave a response, or trackback from your own site. I love both items. The finished socks look like the perfect pair for summer!